Before biting into this candy, I did a little background checking on it. Palmer Candy Company, the mastermind behind the Twin Bing, has been around for over 130 years and the Twin Bing was concocted in 1973. They must be doing something right. The Twin Bing definitely has the cow pile look. Donâ€™t get me wrong, we loved Momâ€™s Cow Piles. Gross-looking does not equal gross-tasting and that is exactly the case with the Twin Bings. Itâ€™s a rich, scrumptious candy and not at all what I expected. I was expecting something like a cherry cordial, of which Iâ€™m not extraordinarily fond. A Twin Bing is not like a cordial at all. Itâ€™s a chocolate and peanut-filled shell covering a creamy cherry filling. I definitely tasted chocolate and peanut butter right away. I didnâ€™t taste the cherry in the first bite, but once I got to it in the middle of the first twin, it was distinctly, bitingly cherry. The packaging claims it is a â€œnutty chocolaty cherry treatâ€ and without a doubt it is. Itâ€™s curious that the ingredients donâ€™t actually include cherries, cherry extract, imitation cherry, or anything cherry-related. There was â€œnatural and artificial flavors.â€ I guess thatâ€™s the cherry part. Whatever is making the cherry flavor, it works. 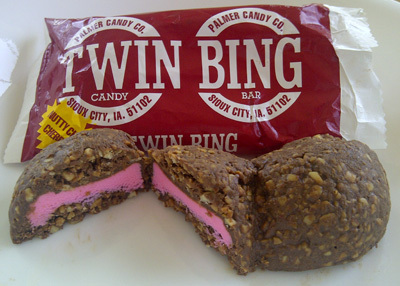 Would I buy Twin Bing again? Without a doubt. It was tasty and different, and I enjoyed it. In addition to the taste, Iâ€™d like to have some on hand for the novelty. Imagine serving these the mounds of gross-looking deliciousness as dessert to dinner guests. These are my husband’s favorite candy-I just bought him a big bag today to give him for Father’s Day!